In the face of global warming, coastal wetlands—including submerged seagrasses, mangrove forests, and salt marshes, and pelagic ecosystems—provide a vital service to the global community by storing large amounts of carbon. Intact coastal habitats have soils that range in depth from less than one meter to over ten meters, storing hundreds to thousands of metric tons of carbon per hectare. 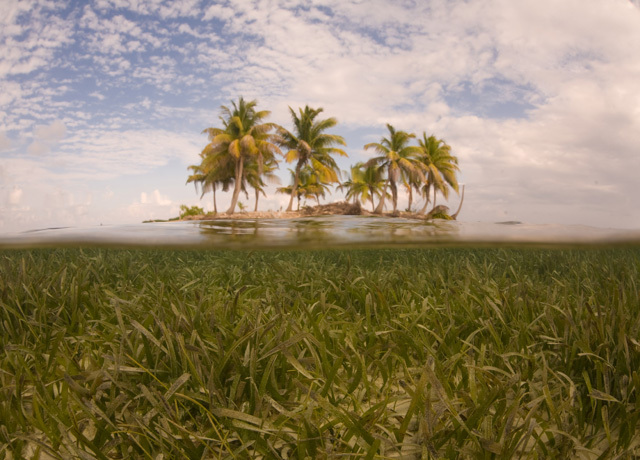 The average hectare of seagrass stores 7 metric tons of carbon in its soil. Working with partners in the University of Cambridge, we conducted a review of all the available science and developed a model describing the relationship between mangrove biomass and climate (temperature, rainfall and seasonality). 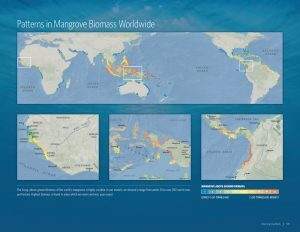 The results of the study confirmed that mangroves are a biomass powerhouse, but it also called out the most valuable areas of all. This knowledge can be translated into action. For the countries with high biomass value such as Indonesia, Brazil and Nigeria, including mangroves in national policies could yield beneficial results in offsetting a certain amount of their greenhouse gas emissions. For smaller island countries, like Cuba and Solomon Islands, mangroves may represent a significant portion of their total forest. When thinking about ways to finance conservation, market-based mechanisms may provide a significant opportunity as they represent one of the islands’ large assets. 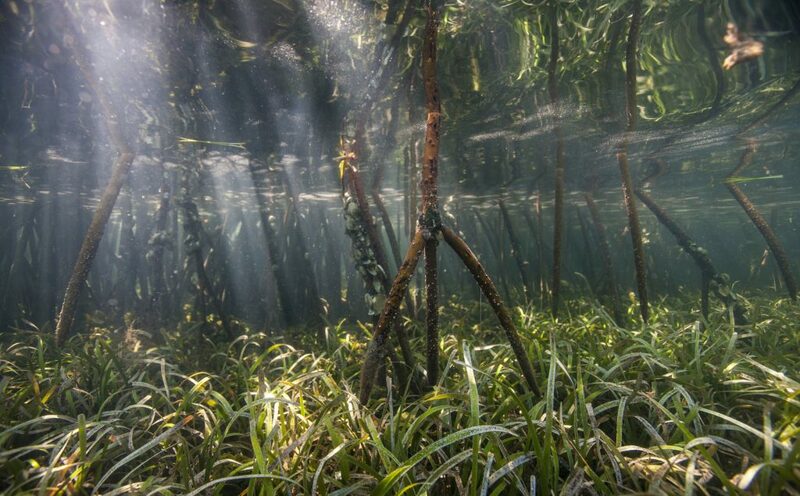 More than 90% of total carbon stock in mangrove forests can be stored in the soil. 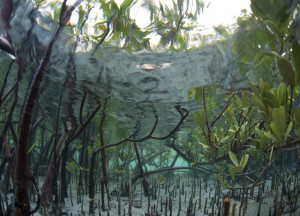 The Woods Hole Research Center, in collaboration with The Nature Conservancy, developed a machine learning-based model to predict mangrove soil carbon storage based on climatic, vegetation, topographic and hydrologic properties that can be inferred from satellite data. Using this model, they were able to estimate the carbon storage within any mangrove forest in the world. The study found that mangrove soils hold more than 6.4 billion tons of carbon globally, but that mangrove forest destruction caused as much as 122 million tons of carbon to be released to the atmosphere between 2000 and 2015. Read the paper here. View mapped data here. Our Australian project focuses on modelling and mapping the social and economic values of saltmarsh, seagrass and mangrove habitats through fisheries, recreation, tourism, blue carbon and coastal protection. 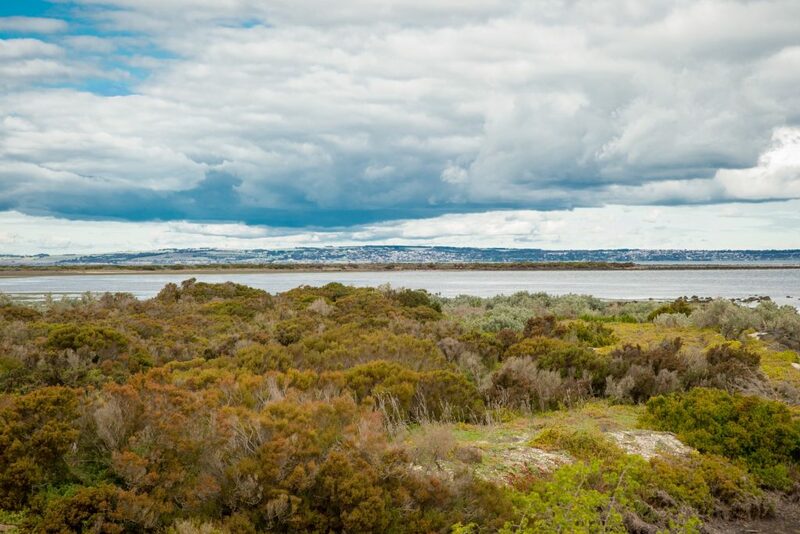 We use a geographically nested, case study approach with a focus on marine habitats that occur in central Victoria and northern New South Wales, specifically Port Philip Bay and Western Port Bay (Victoria) and the Richmond River/Tuckean Swamp estuary (NSW). Read more here. Coastal carbon, or blue carbon, is carbon captured by living organisms in oceans and coastal habitats that is stored in the form of biomass and sediments. The secret of blue carbon lies in the soil. Of course, they also have an important living biomass, especially mangroves, but coastal wetlands, unlike almost any other ecosystem, have thick, waterlogged organic muds. As it falls to the ground, dead plant matter is trapped by the wetlands’ complex root system. There is little or no oxygen available to break it down and so it accumulates in a rich peat. 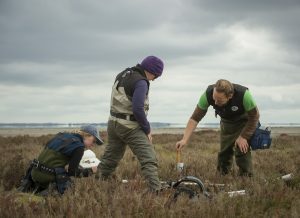 Unlike freshwater peats, however, the saline waters in coastal wetlands also prevent bacterial breakdown which would otherwise lead to the release of methane—itself a powerful greenhouse gas. The carbon rich soil remains tightly packed, layer upon layer, out of circulation in the soil, sometimes for thousands of years. These systems also store external carbon as coastal ecosystems act as sediment traps for runoff from terrestrial systems. Once trapped in the wetland, they too are buried in the soil. Intact coastal habitats have soils that range in depth from less than one meter to over ten meters, storing hundreds to thousands of metric tons of carbon per hectare. The high rate of loss creates twin problems—first, they expose us to large amounts of a carbon being released from the biomass and the soil, accelerating global warming. Secondly we are losing some of the only effective carbon scrubbers on the planet. 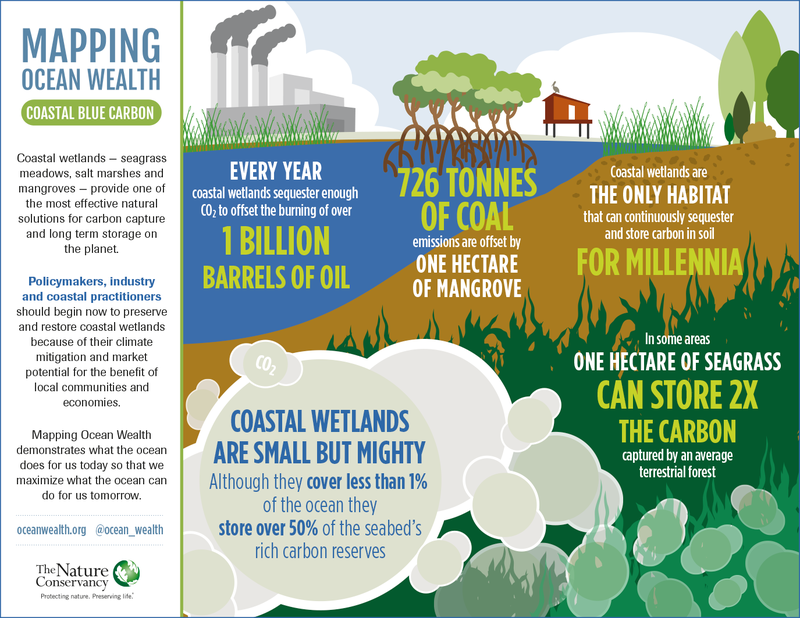 Coastal habitats loss is estimated to be between 0.5–3 percent of their global area per year resulting in 0.15–1.02 billion metric tons of CO2 released annually (equivalent to burning 112 billion gallons of gasoline). This loss is largely due to human causes of conversion related to coastal development, aquaculture and agriculture.